Title -The Vengeance of DragonKlaw! Doom observes alarming disturbances under the sea around Nueva York. He also glimpses Ravage heading towards New Atlantis in a very familiar vehicle. Although the cover date is June, coinciding with Doom 2099 #6, I have no problem placing this small scene before #5. It fits nicely between Doom's victory over Wylde and getting down to business rebuilding Latveria. Art is by Paul Ryan, his only depiction of Doom 2099. Paul also had a 6 year run on the Fantastic Four, where he had the opportunity to draw Doctor Doom many times. In the aftermath of Tiger Wylde's downfall, Doom proceeds to clean up Latverian affairs. He tells Fortune that construction of a new Castle Doom is important to solidifying the new government. He also meets with the Independent Elite, a small guild of assassins living in Latveria, and renegotiates their contract with Latveria. Meanwhile, in cyberspace, a viral net-glider named Fever successfully penetrates Doom's armor defenses. From inside he begins to wreck havoc and take control of Doom's armor. After Fortune runs a thorough test Doom has Wire hook into his armor and run his own system check. Wire finds that the core program of Doom's armor has been infected with an extremely infectious virus that can withstand industrial strength cleaners. 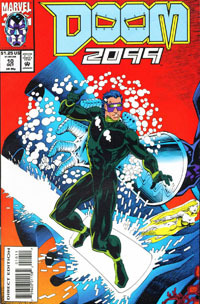 Wire decides to return to Doom's armor on a search and destroy mission using a revamped version of the disinfectant he used before. This time Doom decides to join Wire and venture for the first time into cyberspace. Soon after beginning their journey Wire and Doom are detected by "the virus" and are thrown into a wormhole. At the other end they find that they are no longer in the systems of Doom's armor but in a real space simulation. As they reappear in new yet familiar surroundings, Doom and Wire come face to face with the "Fantastic Four." First appearance of the Guild of Independent Elite. The elite includes Chill, Scratch, and Fade. In researching Doom, Eduardo De Vargas mentions the Richards Archives. As Eduardo De Vargas is researching all known information on Doom, his screen shows images of Doom's armor through the years. 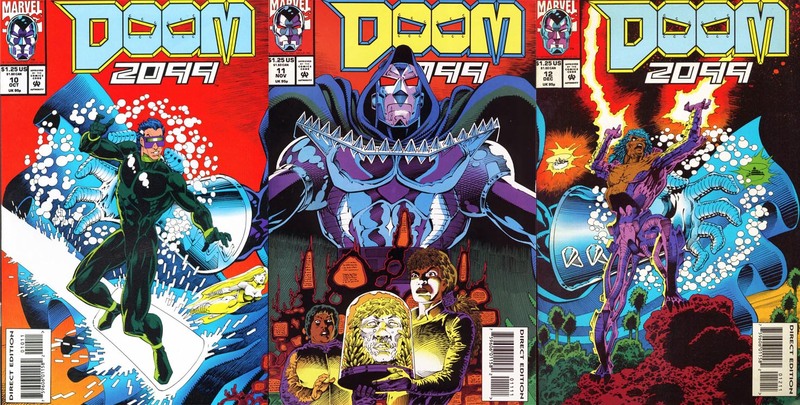 The armors shown are his first appearance armor from Fantastic Four #5, the traditional armor which he has worn since then, the one-off redesign by Walt Simonson from Fantastic Four #350, and lastly his Doom 2099 armor. Fortune's brother Kaz makes his first appearance, albeit in a short flashback. This flashback also reveals some background to Fortune's strained relationship with Poet. More hints are given regarding Xandra's background. 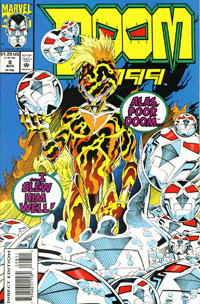 The Fantastic Four featured in this issue have taken on characteristics of other characters. Thing looks like the Hulk, Human Torch looks like Ghost Rider, Invisible Woman has the powers of Medusa (of the Inhumans), and Reed....he has a pony tail. 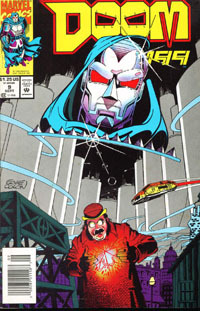 Doom and Wire are chased through the Baxter Building by "The Fantastic Four." When they reach Reed's lab, Doom hands Wire the Ultimate Nullifier. With it, Wire distracts the Four until Doom uses the Time Platform to transport them into the past. Wire and Doom then exit the simulation and return to the main outlet of cyberspace to try to return to Doom's armor system. Meanwhile, in the real world, Fortune is kidnapped by the mysterious Haze. As Xandra stands watch over Wire and Doom, Poet sneaks up behind her. He inquires after Fortune, Xandra tells him she away on government business. The conversation soon turns to his tense relation with Fortune. Poet explains that Fortune blames him for the death of her brother, Kaz. In cyberspace, as Doom and Wire continue to trail back to Doom's armor system they are met by the infamous net-glider, Duke Stratosphere. Duke, convinces Wire and Doom that he will lead them back but instead delivers them into the hands of Fever. Duke leaves them with Fever having played his part and repaid a debt he owed Fever. Fever meanwhile stuns Wire and attacks Doom. In the real world, Poet and Xandra watch helplessly as Doom and Wire flat line. First appearance of Duke Stratosphere. Title - A Region of Ether and Sighs! After being cut off from the real world by Fever, Doom and Wire's real world bodies begin to seizure. Xandra performs CPR on Wire and manages to reconnect his real world self with his cyberspace archetype. In cyberspace Wire regains consciousness in time to watch Fever push Doom and himself into another wormhole sending them even further away from their real world selves. The two now face eventual derezzing [deresolution]. In the outside world, Fortune awakens to discover that her captor is Eduardo De Vargas and he is offering her a chance to join him. Back in cyberspace, Doom and Wire explore the wasteland of discarded programs for one that can help them reach their real world selves before they derezz. Amongst the programs they are discovered by Catscan, a poltergeist program which feeds off of anything it finds. It attacks and completely derezzes Doom. Not considering Wire a threat Catscan leaves Wire alone. Using this advantage, he searches through the littered programs and finds the original search engine which the PIXEL corporation was founded on, PALOMA. 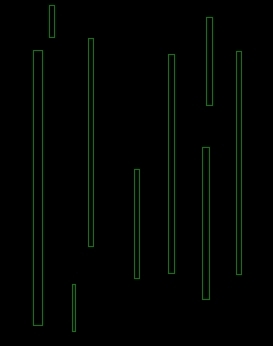 Wire uses PALOMA to recreate Doom's archetype. Catscan returns and its arrival causes PALOMA to be pushed into Doom. PALOMA's tactile interface reacts and Doom begins draining PALOMA's resources. Channeling her vast power, Doom destroys Catscan. But as he continues to absorb data via PALOMA's network connections, he goes mad. Xandra briefly calls Wire by the name of Wyatt. Doom continues to siphon off energy from the very heart of cyberspace. With his power continually expanding Doom decides it is time to take on Fever. A massive battle ensues which rages all over cyberspace. 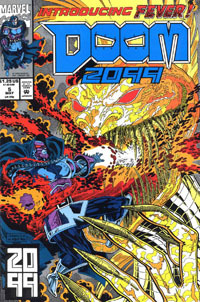 The battle between Doom and Fever is watched by on lookers all over the 2099 universe. Meanwhile Poet rescues Fortune and together they attempt to take control of De Vargas's zeppelin, Cicada. In cyberspace Doom deals the final blow to Fever who is rendered comatose. Doom then turns his sights on De Vargas who he knows hired Fever. Unfortunately Doom is so caught up in his revenge on Vargas that he does not realize that by shutting off all the controls on board De Vargas's ship, he is condemning Poet and Fortune to death as well. In cyberspace Wire makes a desperate gamble as PALOMA tells him that the only way to restore Doom to his regular archetype is to erase her own program. Wire does so but finds that he may have made things worse. 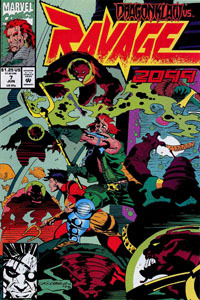 Cameo appearances by characters from all of the 2099 books of the time: Dana from Spiderman 2099, Jake Gallows of Punisher 2099, and Ravage 2099. Amongst the data Doom absorbs, he learns that the gene patterns of six men and seven women with immense power is being stored in a databank in Iceland. Who these people are is never revealed. Using a cybernetic recovery program, Doom and Wire attempt modify it to locate Doom's lost memories as if it were lost data. In the program, the two emerge from a thick fog in what appears to be Victorian London. A woman's death cry brings them to the scene of Jack the Ripper's final murder. Doom grabs Jack and attempts to shake out of him some secret, but the murderer flees. Wire asks Doom what he hoped to learn. The secret of death he answers. Soaring into cyberspace again, the two arrive elsewhere and see the Frankenstein Monster being attacked by a mob. From him, Doom obtains the secret of life. Next they meet Sweeny Todd and his accomplice Mrs. Lovett, Jacob Marley, and finally Professor Moriarty. Wire however sees Moriarty for what he is, a viral anomaly which feeds off of information. Moriarty attacks them. Doom manages to repel his attack. He sees that Moriarty has palmed the knowledge which he seeks from the previous archetypes he has been to see. Doom attempts to recover the data, but Moriarty summons Jack the Ripper who takes Wire hostage. Wire manages to disable Jack himself, meanwhile Moriarty alters the landscape into a virtual Reichenbach Falls. Moriarty stumbles into his own abyss while Doom escapes. Both Doom and Wire exit the program. Wire asks if Doom was able to get his memory back. Doom answers that Moriarty managed to spin off the data just as he did with Jack. For now, the data is lost somewhere in cyberspace. Doom contacts five Victorian characters that represent his personality, Jack the Ripper, Jacob Marley of Charles Dickens' "A Christmas Carol", the creature from Mary Shelly's "Frankenstein", Sir Arthur Conan Doyle's Professor Moriarty, and finally Mrs. Lovett accomplice to Sweeny Todd the demon barber. Doom and Wire have exited the cyber recovery program which they traveled in previously. Upon exiting the program, Doom remembers that Wire denied him ultimate control over cyberspace when he deactivated PALOMA. Doom is once more unstable and attacks Wire. PALOMA suddenly appears and comes between them. She reveals that she was not deactivated but given self-awareness. Eventually Doom and PALOMA come to an arrangement. In the real world, Poet and Fortune regain control of the Cicada with Doom's assistance in Cyberspace. Back in Latveria, Doom's deal with the Guild of Independent Elite pays off as they fend off De Vargas' invasion of Latveria. With the country safe, Doom and Wire return to real space. With PALOMA's cyberspace resources, Doom wrests control of PIXEL from De Vargas. Installing into De Vargas a cybernetic implant, Doom gives PALOMA a real world vehicle and control over PIXEL; in exchange he has access to the company's resources as well. Later, at the grand opening of the new Castle Doom, Xandra informs Wire that the Guild of Mercenaries have offered her an apprenticeship and that she is leaving Latveria. Meanwhile, Fortune receives shocking news that a Chinese craft crashed into Latveria and the pilot claims that her brother Kaz is alive and in great danger. 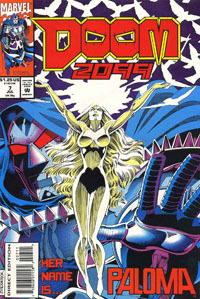 The issue included a poster of Doom which on the reverse side advertised a free 2099 Sketch Book. 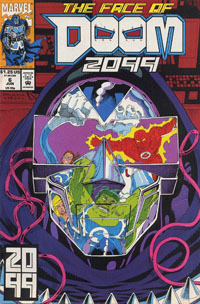 All other 2099 books that month included a similar character poster, which when put together would show the four principals in front a large 2099 logo.